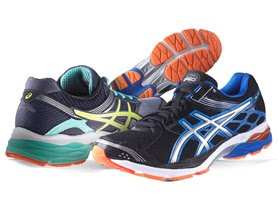 Hurry over because right now you can get Asics Men's and Women's Gel-Pulse 7 Running Shoes for as low as $49.99 (Retail $100)! Rearfoot and Forefoot GEL® Cushioning Systems: Attenuates shock during impact and toe-off phases and allows movement in multiple planes as the foot transitions through the gait cycle. "Solyte® Midsole Material: A lighter weight midsole compound than ASICS' standard EVA and SpEVA®. Also features enhanced cushioning and durability.